Later, MayJune would say that the biggest turns in life come when you’re paying the least attention, making small choices you don’t yet know will change everything. 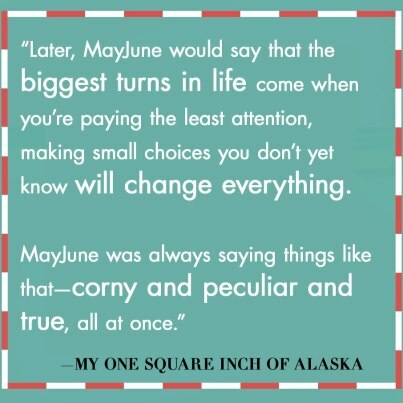 MayJune was always saying things like that—corny and peculiar and true, all at once. But, of course, I hadn’t met her yet when I found Mama’s clothes stuffed in suitcases with mothballs and made my first small choice: Instead of snapping the suitcases shut and forgetting my discovery like I knew I should, I counted the pieces. Dresses, skirts, blouses, pants, but mostly dresses—fine dresses,afternoon-tea dresses, party dresses, even costumey dresses with feathers and sequins. But not life-in-Groverton dresses. Mama’s wedding dress, a white satin and lace and mother-of-pearl-button confection, filled one suitcase all by itself. There were also hats and shoes and a few purses, but I didn’t count them. It was October 1946 when I found Mama’s clothes. I was ten years old.Making my first trip to the forbidden basement, I cradled armloads of home-canned green beans and corn and tomatoes, fall harvest gifts from neighbor women who,even with the war over, still had victory gardens and made it their business to worry about us. Fearful of slipping and dropping the jars, I stared past my arms at each step mottled with dull blue paint, remembering Mama’s warning that it was too dark and dirty down there for Will and me. Fear crept in when the wobbly bottom step threw me off balance. In that moment between almost falling and not falling, I saw the suitcases lined up against the wall, in the shadowy corner behind the Singer sewing machine. My hands trembled as I opened the big trunk first. The Mama we knew dressed in dowdy house dresses or bathrobes, occasionally some denim pants and a loose blouse, or a simple dress. Nothing with even the tiniest downy feather or hint of sparkle. But these clothes had to be Mama’s. Underlying the mothball smell was a hint of rose and jasmine—Mama’s scent. I scooped an armful of clothing up to my face and breathed, as if by inhaling deeply enough I’d bring Mama back. I wondered where Mama might have gotten these clothes. Definitely not from Miss Bettina, even though she had been Mama’s best friend, owned her own dress shop in downtown Groverton, and lived next door to us on Elmwood Street. The dresses Miss Bettina wore and sold were dark hued, proper. These, other than the white wedding dress, were all bright colors—azure, scarlet, tangerine,emerald—and featured plunging necklines, side slits, even backless designs. I put Mama’s clothes back in the suitcases. Then I went to find Babs Wickham, my best friend, and told her she had to come over. I showed her the clothes—all except the wedding dress—a treasure trove for dress-up. But Babs proclaimed dress-up as babyish, and whispered that she had taken something really special from her own mama—a Max Factor Red-Red lipstick. Giggling at each other in my dresser mirror, we assured one another that our red lips made us, finally, grown-up. And a grown-up would know, instinctively, that asking Daddy about those clothes would take us into territory far too dangerous. So I never mentioned Mama’s mysterious clothes, never looked at them again. But I thought about them,for seven years, until I secretly began remaking those clothes, one by one,into outfits of my own creation. Such a small choice, I thought. In September 1953, it was the fourth day of my senior year of high school and Will’s fifth grade. That morning I became so absorbed in sketching a design for a dress—sleeveless, slim lines, just right for one of Mama’s old yellow prints—that I didn’t notice the toast burning and the stove clock ticking, until my little brother, Will, tried to talk with his mouth full of Marvel Puffs and instead spit a gob of cereal in my ear. I started to snap at Will about table manners. But he stared at me with his wide blue eyes and his cheeks so ridiculously bulged with cereal that I had to laugh. Softly, of course. Daddy’s bedroom was just on the other side of the kitchen wall. I jumped up from our kitchen table and ran to the toaster, forcing up its stuck lever. The whiff of burned toast soured my stomach. I hated that bitter smell,and the sound of removing the char, but I pulled open the utensil drawer—the one that took two tugs to get past its sticking spot—got out a knife, and started scraping away. I looked over at Will. He was a little pale around his mouth. Too many servings of Marvel Puffs, instead of hearty breakfasts with eggs or sausage. And unburned toast. Another pang of guilt . . . I should try harder to take care of Will. “You don’t have to eat burned toast,” he said quietly. That was as close as he ever came to inviting me to eat Marvel Puffs. He was saving up cereal box tops to send in to the Sunshine Bakery Company for the prize of his wildest dreams: an official, certified deed to one square inch of the Territory of Alaska, a promotion Marvel Puffs was doing with Sergeant Striker and the Alaskan Wild to advertise the show’s television debut and, of course, the cereal. Kids who included a 250-word essay with the box tops were in the running for having their photo with the actor who played the television Sergeant Striker featured on the front of Marvel Puffs boxes. Marvelous. Better than a peashooter,anyway. Will’s rule for earning his deed: eating all ten boxes of Marvel Puffs, not one puffed morsel left in box or bowl. Asking for help would be cheating, as bad as bratty Howard Baker across the street, who whined until his mom bought ten boxes at once, just for the box tops, and then threw away the cereal. Daddy or I could have Marvel Puffs, but only if we asked. We didn’t. I had rules, too. I didn’t spend our household money on overpriced Marvel Puffs; Will had to buy them with his newspaper route earnings. And I didn’t eat cereal that looked like grubs and made strange popping sounds when milk was poured on it. “Thought we were out of grape jelly,” Will said, and popped another spoonful of cereal into his mouth. We were. Of course we were. We were out of grape jelly and macaroni and applesauce, and had been for a week. I’d put off going to the grocery because I’d been so focused on finishing the dress I wore that morning, made for my interview after school for a secret job, one I hadn’t told even Babs—still my best friend—about. I already had two jobs everyone in Groverton knew about: doing alterations at Miss Bettina’s Dress Shop and waitressing at Dot’s Corner Café. But those jobs were for helping my family. Grandma Dot—Daddy’s mother—said I reminded her too much of Mama, so she gave my wages and tips to Daddy. “Your mama was reckless with money,” she’d say (as if Daddy wasn’t), quick to add “God-rest-her-soul,”just like that, like the phrase was one word, the perfect word for excusing any comment. From sneaking back some tip money, plus just a little from my alterations work, I’d saved $83.12. But that wasn’t nearly enough to fund getting out of Groverton, Ohio,for good, after my senior year. I hadn’t told Babs or Will about that, either.Babs would just laugh at me—“Oh, Donna, you’re such a dreamer!” And Will would look at me with fear in his big blue eyes, but I told myself that he was growing fast, that he’d be able to deal with Daddy next year. “Shush!” I hissed. Will had said the last bit too loudly. We had a whole Morse code of looks and tones where Daddy was concerned. Some mornings he got up, joining us for breakfast as polite and proper as could be. Other mornings,if he’d stayed out late the night before, he’d be angry—or, worse, sullen and sad—if we woke him up. I lifted my left eyebrow to let Will know that this was one of those mornings. But then Will looked so sorry that I patted his arm. “It’s OK,” I said quietly, words I’d learned to tell Will even when they weren’t true. I bit into my toast, studied my sketch. Maybe if the neckline had more of a scoop . . .
Will sidled up close to me again and said around another mouthful of Marvel Puffs, “Why can’t I just meet you after school and go with you to the library?” This time, he sent the moist little specks onto my cheek. Instead of looking terrified, Will swallowed his cereal and started to laugh—but then the telephone in the living room rang. Two short bursts and along trill, our ring on our street’s party line. Will and I stared at each other. My stomach lurched. But I was in the living room answering the phone before the next long trill, my voice a breathless whisper as I said, “Lane residence.” I stared at the door to Daddy’s room, wondering if I’d heard restless movement. I winced at Babs’s giggly attempt at sympathy. I didn’t care if Miss Bettina heard; she knew all about life at the Lane house. But I couldn’t risk Mrs.Baker or other neighbors picking up the shared line. That was her code for having the family car, most likely because her mama had gone with her aunt to visit their sickly mother down in Lexington, Kentucky. Babs’s daddy, who was editor of the Groverton Daily News, walked to his office and spent long hours there. Her code also meant she wanted to skip school with me. We’d just use the “indisposed by our visit from Auntie Flo” excuse to avoid a truancy detention. Even the most veiled menstruation reference flustered Principal Stodgill. My heart jumped at the prospect. I would not have trouble talking Babs into driving over to Rike’s Department Store in Dayton, and I suddenly longed to see the newest fall clothes: silk dresses, tweed skirts and velvet-trimmed jackets,fur-and-felt hats, leather gloves with lace cuffs, stacked-heel shoes. . . .I loved Miss Bettina and her dress shop, but Rike’s was special. But then I looked down at my own dress. I had to get to my secret interview. “I’m sorry, Babs,” I said quietly. “I have a . . . an actual school project this afternoon. I’m worried about a big test. In Algebra. I need to study at the library starting at four or so before I go to work at Grandma’s.”Babs wasn’t in my—or any—math class. I was one of the few girls in Algebra, but I’d insisted on taking it instead of home economics. I liked math, while Mrs. Irvine’s bad instructions on how to set a shoulder seam or insert a zipper pained me. Babs giggled. “Since when do you have to study to get good marks? Listen, I promise we’ll wrap up our school project in time for you to get back for your . . .school project.” Babs giggled again, and I knew she had definitely raided her mom’s Dexamyl. I worried about riding with her—I didn’t know how to drive, just yet—but then I thought of those dresses at Rike’s. . . .
She hung up before I could protest. “Special surprise” probably meant she’d want to buy me something, and I didn’t like taking Babs’s charity. I decided to take fifty cents from my escape-Groverton savings to cover lunch at the Rike’s sandwich counter. I suddenly noticed the time on the stove clock. Seven fifteen. Babs would expect me to be at the corner of Watershed and Sixth before school started at eight. Babs was always impatient; she’d take off without me if I was too late. Will wouldn’t leave without finishing his Marvel Puffs. I put my sketch book back on the table. “Will, you’re right. I can’t eat this without grape jelly.” I smiled at him as I plucked the ruined toast off the Marvel Puffs box and took it over to the counter, where I left it by the foul-tempered toaster. I got out a blue Fiestaware bowl, one of the unchipped ones, and a spoon, and carried them over to the kitchen table. I sat down and poured the rest of the Marvel Puffs into my bowl, bottom-of-the-box cereal dust and all. Will answered with a solemn nod. I poured the milk left in Will’s bowl into mine. I brought the spoon to my mouth. The cereal smelled like wet cardboard—worse than burned toast. But Will fixed his big blue eyes on me, so I finally took the bite. The cereal tasted like . . . nothing. Or maybe nothing with a hint of oatmeal. But as I chewed, the bite seemed to just get bigger. I thought, No wonder the stuff is called Marvel Puffs, and I’ll never get through the bowl. “What do you think?” Will asked anxiously. Will stared at me, clearly staggered, his disbelief about Babs suddenly forgotten. “You said if I went there again, you wouldn’t talk Dad out of giving me a whipping,” he said. I swallowed back shame. I had made that threat, after Mr. Stedman’s last visit to our house to complain about Will feeding the dog. But Stedman’s Scrapyard, down by the river near Groverton Pulp& Paper, was on a shortcut to where I was supposed to meet Babs. Will could just run down Sixth and cut over to Plum and get to school on time. I looked away. “Go on—get your book bag before I change my mind!” I poured the leftover cereal into the Marvel Puffs box. Then I carefully tore off the box top and held it out to Will. He took it, wide-eyed, as if I had just handed him a deed to the entire Territory of Alaska. Will hollered, “Trusty, we can trust this case is closed!” It was the cheesy closing line Sergeant Striker shouted to his dog at the end of every episode. He clapped his hands to his mouth and gave me a look that said, Sorry! We froze, but Daddy’s room remained silent—none of the crying out in restless sleep that usually followed a late-night bender. Will grabbed his Marvel Puffs box top and rushed from the kitchen through the living room to the stairs, and up to the tiny second floor of our Cape Cod–style house, where we each had a bedroom. I dropped the burned toast in the Marvel Puffs box, then quickly washed the dishes and wiped up the counter and table. I heard Will coming down the stairs—that third step from the bottom always squeaked—when I remembered one last thing. I hurried through the breezeway to our garage, pulled the string for the bare-bulb light, and went to the freezer, from which I pulled out a chicken. It was Friday; the chicken would thaw in the refrigerator in time for Sunday’s supper. I could already see Grandma poking at the chicken, saying, Such a luxury, having a garage AND a refrigerator AND a freezer. Tiny claws skittered nearby. I turned in time to see a mouse scurrying underneath the car. Every time I came out to the freezer, I tried to ignore the car, a 1946 Ford convertible, top still down, the open dash and seats covered with a picnic tablecloth with a faded red border and dull yellow ducks and lambs and farmhouses and flowers, as if the last time the car was parked in our garage we’d all returned from a long picnic by Tangy River (upstream from the paper mill)and, too happily exhausted to put things away after our family excursion, just jauntily tossed the then-bright tablecloth over the open seats in a moment of silly abandonment—look at us! The perfect family, doing an imperfect job of cleaning up after our perfect family picnic! What a lark! But I had no such memories, not even ones as faded as the tablecloth. At most, if I pushed myself I could summon, in a hazy, gauzy way that would surely sadden the once-bright ducks and lambs, some impression of riding in the car once or twice. But I wasn’t convinced that was a real memory. I shook my head. No time for not-remembering. Skittering. The mouse was back out from under the car, right at my feet. I grabbed the straw broom by the door and whacked the mouse, stunning it. I started to whack it again, but at its slight quiver, I opened the door and shooed it out with the broom. I waited a second, long enough to see the mouse regain its senses and run off into our overgrown backyard. That’s right, little mouse. Run away from here. . . . Far away . . .
By the time I picked up my school bag and the damp box of Marvel Puffs,careful to hold it away from my new dress, I expected to see Will waiting on the front porch. He wasn’t there. Then I saw his books scattered down the porch steps. The scruffy heels of his shoes. His long legs in the pants that I’d ordered special from the Montgomery Ward catalog, that he hated because they were too big, that I’d told him he’d grow into. His arms at odd angles pointing away from his body. His head turned so that I couldn’t see his face.